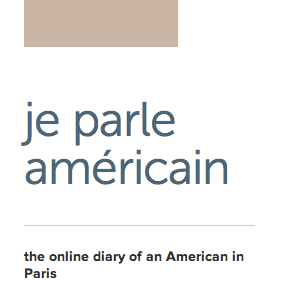 je parle américain started out as the online diary of an American in Paris: a 30-something 40-something-year-old <sigh> former lawyer, married to a French citizen, doing his best to immigrate and integrate into French society. Read about the blog’s name here. je parle américain was created in January 2011 as the website for an “English language consultancy.” (To read about the hilarious translation error on a French menu that sparked that brainchild, click here.) Because of French employment and immigration laws that prohibit self-employment with certain visa types, however, je parle américain underwent a sudden and extreme makeover in June 2011 to become a chronicle of the experiences and observations of daily life in Paris from an American perspective: the beautiful and the frustrating, the bizarre and the poignant, the extraordinary and the mundane. The blogposts were eclectic, ranging from railings against the inefficiency of French bureaucracy, to historical accounts and linguistic insights, to the backstories of tasty French pastries, to tender moments about family life … but they were almost always served up with a dose of humor. Now je parle américain has evolved once again into something new, a website for my English-teaching career. The old blog articles are still available, however. Just go back to the menu and look for the link to the blog archives.